Analysis: Record breaking season for Exeter? 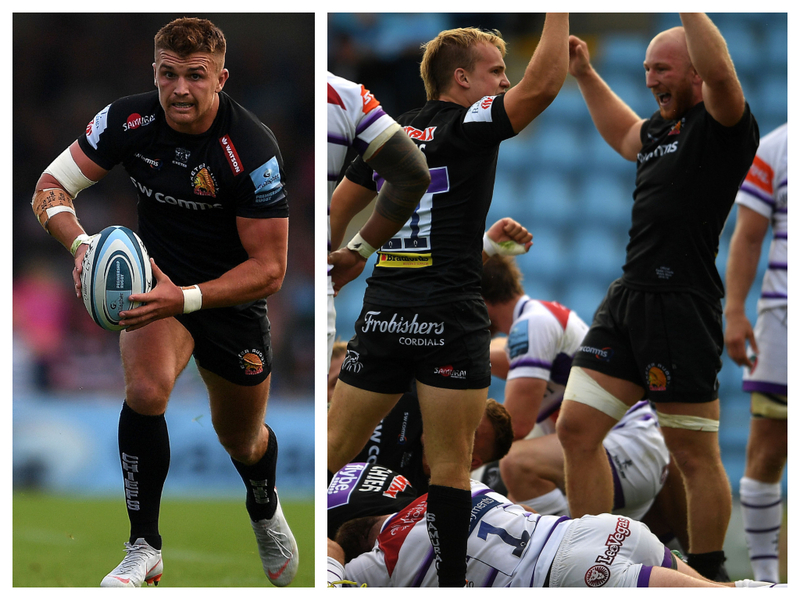 Our analyst Sam Larner returns and is full of praise for how last season’s beaten Premiership finalists Exeter Chiefs have started this campaign. Last season Exeter played 30 games in domestic rugby, they scored 40 points or more on eight occasions and 30 points or more in 17 outings. To start the season they have already scored 40 points in both games against opposition that they may very well face again if they make it to the play-offs. They’ve scored 12 tries so far, more than any other team, and 82 points, also the most of any team. Last season Exeter’s games had the most ball in play time; 41 minutes and they had the most time in attack of any team, 23:40 – 3:49 more than the next best team, Gloucester. Despite the increased ball in play time Exeter also defend the least, just 17.18 which is 48 seconds a game less than the next best team, Wasps. That’s a good set-up if you want to score lots of points, have the ball for a long period of time, Exeter though combine that with scoring efficiency. So far this year they have had 35 clean breaks for their 12 tries, so around one try for every three clean breaks. Having lots of the ball and being efficient when you have it is going to make the Chiefs very hard to beat this year, but what exactly are they doing when they attack? We know that Exeter are excellent when it comes to mauls and they scored two tries from a maul last weekend. Even the best mauling teams can’t do it from their own half and this kick from Henry Slade is a perfect assist. The centre sends it from the middle of the pitch and around 40 metres out and the ensuing line-out is from just 5 metres out. Notice how the front lifters kick out of the line so that when the ball is caught they are immediately there to secure the ball when it comes down. The alternative is to get the rest of the line-out forwards to peel around the ball which adds a layer of complexity and an increased possibility of losing the ball. This maul ends up being collapsed with the penalty going to Exeter. Again Exeter move players out of the line early, some referees would penalise this because the scrum-half is also there as a receiver but Exeter have got away with it, probably because it looks like they may actually be lifting options. Watch how Exeter ride the initial push and wait for all the Wasps players to gather on one side then they just restart the drive and it’s easy against no forwards. You can see again how Exeter drop men out of the line-out to assist with the maul, in this clip there’s basically three forwards not in the line-out waiting for the jumper to come down. This line-out is a little too far from the line to be driven over but they do end up with another penalty and another line-out. Again there’s forwards out of the line and they hold the push and wait for Wasps to show their hand. Interestingly, Wasps stack up on the near side, pushing the play infield and not towards the touchline. The maul stalls briefly but then it gets going again when the Wasps players all disappear down one side and the Exeter maul has only the might and mass of Christian Wade standing between it and a try. Needless to say that wasn’t a good match-up. Exeter aren’t a one dimensional team though and it doesn’t all come down to their strength at the line-out, 10 of their tries this season have come in open play. If you haven’t seen this style of play with a pod of forwards and a playmaker deeper out the back, you really haven’t been watching enough rugby. It stresses the defence because it forces them to defend not just multiple options laterally but also in terms of depth. Teams are also able to move the ball more quickly to the wingers and give their playmakers an opportunity to attack space rather than immediately be under pressure as they would be without this depth. Take this example with Slade, who is given the room to attack the line and he uses his pace to stress the defence. In this example Slade is up against a line of backs so although he tries to use his pace to carve a hole through the defense he’s ultimately hauled down. Watch him do exactly the same thing but this time with Brad Shields thrown in to the mix. Slade has plenty of depth and he simply runs at Shields’ outside shoulder and the hole opens up for the centre. The ability to turn these seemingly innocuous and non threatening opportunities into tries is the mark of a great team; if you can take the surefire opportunities and throw a bunch of tries in from the above situations then you’re going to win plenty of games of rugby. Take that team of forwards who can drive the ball over the line from a maul seemingly with ease and throw in backs who can shift the ball like in this clip, with speed and accuracy and you have a particularly potent mix of attacking possibilities. Finally, once you’ve played your forwards card and your backs card you’ve got the wildcard – you’re not going to get chances like this every game but you need to finish the ones you do get. Exeter lead the league when it comes to try scoring, they were second last year, second the year before and joint first the year before that. They combine that with a sturdy defence which is a combination that is pretty much guaranteed to get you to the play-offs. The big question though is whether Exeter are able to continue pushing up the league table and score yet more tries this year. Saracens scored 89 last year, will Exeter score more than 90? The early season will go a long way to deciding that, they are already on 12 tries in two games and their next four matches put them up against Sale, Newcastle, Worcester and Bath; it’s hard to imagine that there won’t be any more 40 point games there. With the ability that the Exeter teams have and the sheer amount of possession that they accumulate we might be looking at a record breaking season for the team from Devon.